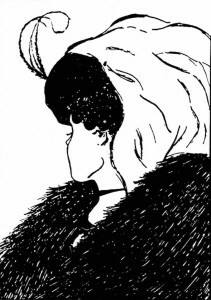 The classic optical illusion ‘Young lady, Old Woman’ commonly used by trainers to demonstrate how we perceive things differently. 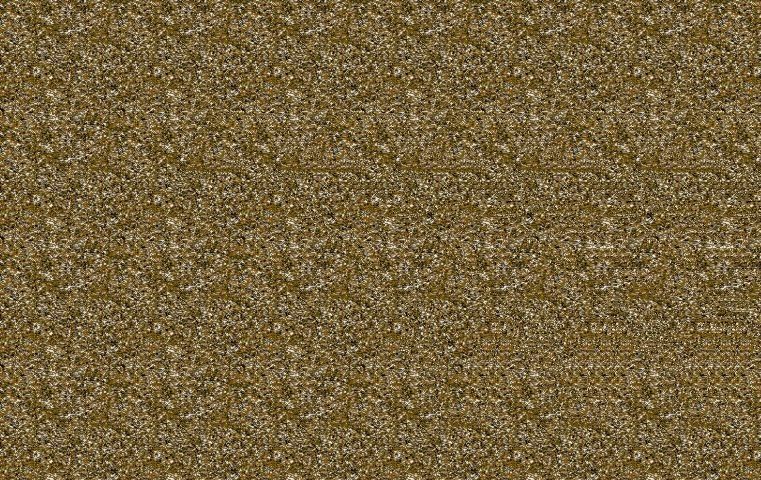 It’s simply a blob of pixels which our minds create meaning from. VUCA was originally born from the US military in the 1990s. It is an acronym describing the Volatility, Uncertainty, Complexity and Ambiguity in the world as it appeared to be evolving. An example of volatility is how oil prices reached nearly US$155 in 2008, only to drop as low as $48 later in the year. This didn’t just affect Exxon and BP, but everything from car manufacturers to airlines - imagine how quick they were to rewrite their hedging contracts. In the section of my book on supply chains, we explore how HP suffered as a result of the Tohoku earthquake, which damaged a critical element of its supply chain. That created uncertainty as cash flows were threatened - a sentiment amplified in the markets. To see complexity, take a look at how our global banking system functions. HSBC, NatWest and plenty of others are struggling as (along with other issues) consumer behaviour outpaces layers of IT infrastructure dating back to the 1970’s. New high-tech ‘challenger banks’ are stealing a march on their legacy competitors with agile and therefore cheaper service offerings. Any Western business looking to do business with China will be tempted by a burgeoning middle class and its desire for Western goods. On the flip side, there’s risk in parting with intellectual property and a bureaucracy which is perceived as unfathomable to Western eyes. That’s ambiguity. Put all these ingredients together and the challenges facing business leaders have never been greater. The greater challenges of the VUCA world have surprisingly human consequences: they require leaders to be the best version of themselves possible. As explored in ‘Analysing to Synthesising’, simple brute force analysis of circumstances won’t work in the future - there are too many unknowns. We need something more fundamental. 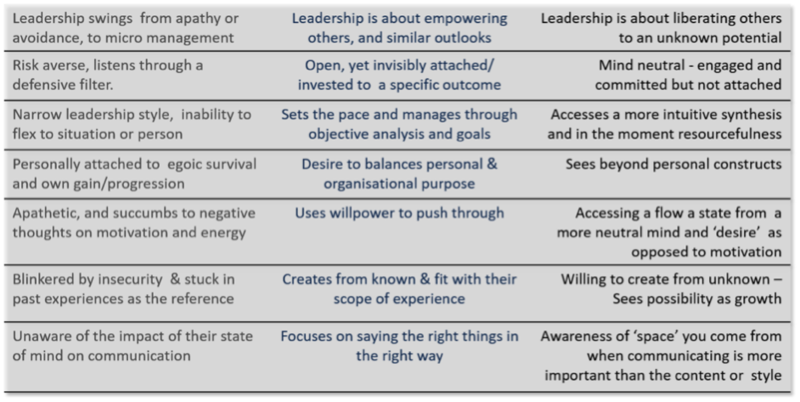 A key element of ‘Leadership to Followership’ describes how leaders of the future will need to instil confidence in teams and bring followers to the top table. By unlocking the potential of their own resourcefulness, this ability will come naturally - sometimes in ways which are already clear to leadership theorists today and others which are currently unknown; new abilities to ride the wave of uncertainty. Leaders of the future will come to realise that their own ‘operating systems’ are what will require fresh understanding. If they do, they will achieve a better ‘Quality of Mind’, enabling resourcefulness on a scale never seen before. Quality of Mind is an individual’s in-the-moment level of access to the potential of their resourcefulness (known and unknown). It sits at a more fundamental level than skills, knowledge and personality - the traditional measures of leadership. To some, this will read as somewhat abstract. Let’s bring just one element to life. Have you ever experienced a moment when you were so focused on something, you lost all perception of time? It could have been writing something, a moment of danger, listening to music, or even something mundane (I often feel this way if stapling papers and stuffing envelopes). This is known as ‘flow state’ and describes a ‘mental state of operation in which a person performing an activity is fully immersed in a feeling of energised focus, full involvement and enjoyment in the process of the activity’. Most of us recognise that we can access an intelligence, clarity, connection, and resourcefulness on occasions, which appears to surprise us. Once this ability is harnessed, we know that we can have fresh new perspectives at any moment. This can be leveraged as a true business benefit. What’s blocking us is a misunderstanding of the determinants of our Quality of Mind. Leaders of the future will develop alignment with the principles of the human mind. In the same way society years ago stopped performing animal sacrifices in order to get more rain, we’ll stop looking to events and circumstances or our psychology to find answers to modern seemingly intractable problems. This new understanding will unlock resourcefulness and wellbeing — it goes beyond positive thinking, mindfulness practices, and understanding ourselves in terms of personality and conditioning. It points to reversing a misunderstanding that we have innocently and invisibly been caught up in. For example, contemporary negatives of leadership include stress and anxiety. ‘Enlightened’ future leaders will recognise these conditions as products of thought and that neither truly exist. To see HQM (High Quality of Mind) traits in a contemporary leader, we only need to look towards President Obama. He listens, connects, is calm and appears to see situations without insecure thinking. Trump represents a contrast. We can also learn from history. Just look towards Mandela or Gandhi, both of whom realised the change needs to be inside out. Both exhibited high quality of mind. There’s plenty of evidence that pursuing activities like meditation, yoga, clean living, massage etc all contribute to a higher Quality of Mind. The revolution we need to realise is that these activities are correlation rather than causation. Work being done by scientists like Dr David Eagleman shows that Neuroscience is beginning to point at what spiritualists and mystics have always known. Put simply, that humans have a capacity to tap into a vast resourcefulness and wellbeing in any moment regardless of external circumstances and without performing any aforementioned rituals. That doesn’t mean abstaining from these activities, we just need a better realised understanding of how the system works, and what causes what. Until we begin to recognise that thought is the source of our experience (as opposed to genetics, environment, personal history, or any other external circumstance, we have no choice but to focus our attention on changing those external factors to enhance and improve our experiences and abilities; nor do we need to pump up or understand the self more. Current understanding of the self is a well-heeled illusion that can be seen through. Once it is, leaders will release the full spiritual capacity of being a human being. The answer lies in understanding how human beings are already designed perfectly to be resourceful, resilient, creative and connected. Thanks to QOM facilitator Piers Thurston for his active contribution and insight with this article. 2025: Holacracy – Rise of Autonomous Teams? TechXLR8: What do we mean by ‘Learned’ and ‘Intuitive’ mind?